While laying the foundations of our practice, we decided to build a focused practice around specific client segments through qualified introductions only. 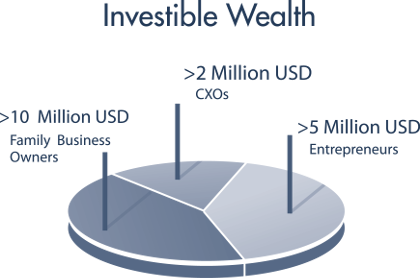 The idea was not just to chase any high net worth individual but own serious clients. And today the quality of wealthy client families being served by us is the validation of our focused efforts. Since CA's Client List would be the envy of any Private Banking Setup, we at CA would gain immensely by sharing our Client list. However, we would willingly forgo this advantage in lieu of protecting the privacy of our Clients. 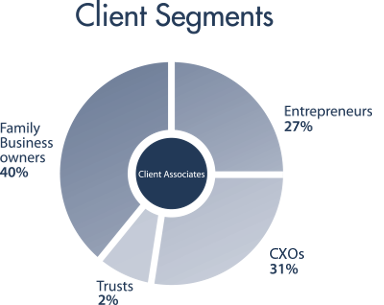 Nevertheless, we'll present a bird's eye view of our Client profile and the distribution of CA's practice across various client segments.